in their bridal sleep under a Cromlech. I had to look up some words while reading this poem, and it is a good thing that I did, because understanding the references is key to understanding this poem. Yeats is the master of drawing on mythology when crafting his poetry, and figuring out the mythological references is necessary when attempting to uncover the hidden meaning in a Yeats’ poem. First I looked up Diarmuid and Grania, and I learned that Diarmuid was a hero who eloped with Grania, who was betrothed to a chief named Finn. Diarmuid was then killed by a magical boar which was summoned by Finn. 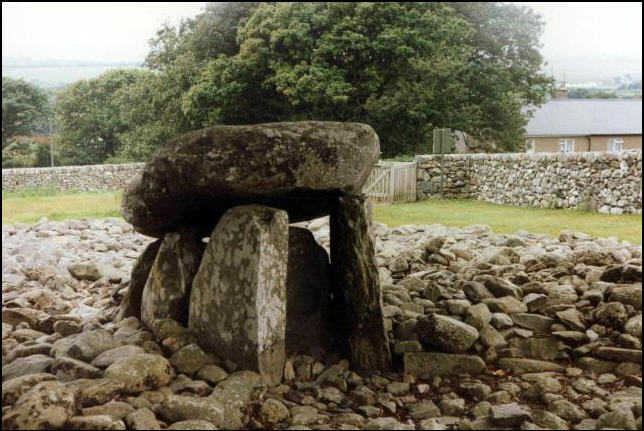 The other term I looked up was cromlech, which in the British Isles is a circle of standing stones, often used as a tomb (see image above). Once I understood all this, the hidden meaning of the poem became clear to me. Basically, I interpret this as a poem about how myths are created. The Faery folk inhabit the realm of the mythical, and as such, have attained immortality, having existed “thousands of years, thousands of years.” The cromlech symbolizes two things. First, it is a portal to the realm of the Faery; second, it is a circular monument immortalizing the lives of Diarmuid and Grania. Essentially, the cromlech marks the transition from just a human story to something transcendent—an eternal myth that will live on in human consciousness. There is one other phrase that supports this interpretation. The Faery folk state that Diarmuid and Grania are “new from the world.” This is very different from saying they are new to the world. They have just come from the world of our existence and entered the dimension of the Faery. Symbolically, this means that the story of their love and of Diarmuid’s tragic death has now become a part of the collective mythology. As a result, they too can expect to live for “thousands of years” as mythological beings within the collective human consciousness. For a poem that lyrically seems very simple, this is very rich and complex. Whenever I read Yeats, I always approach the poem expecting there to be more that what appears on the surface. It is rare that I do not find a deeper, mystical meaning hidden within the lines and words. Hope you enjoyed this as much as I did, and please feel free to share any thoughts or impressions.